Cambodia's King Norodom Sihanouk, while being many things, was way more exceptional than the dilettante he is so often accused of being. Only those with a truly spurious view of the world can believe that you can have a political career of that length and breadth by being a mere poseur. 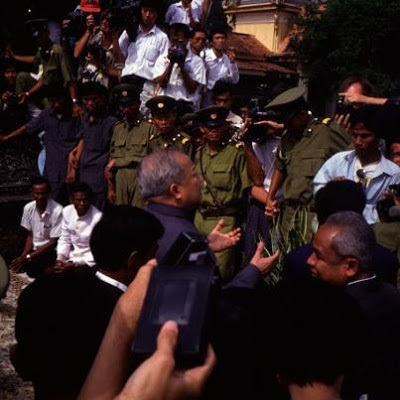 In Sihanouk not alone did centuries collide but ideologies at their most virulent. Privileged and pampered aside, he survived through sheer brilliant perseverance. He was there with them all. Mao, Deng, Suharto, Nehru, Nixon, Kissinger, Ho Chi, Daddy Kim. He was a star of the non aligned movement. Then there was Maggie and Ronnie and then Mitterand. He seemed thrilled to share the cavalcade with Mitterand. But Hen Sen had the guns. 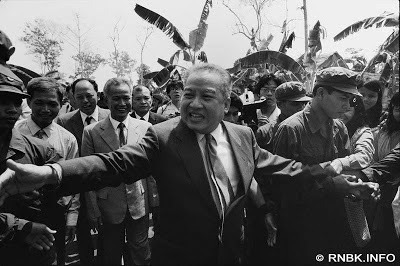 And the Khmer Rouge, withering on the vine, were seduced by Hun Sen before they could be reactivated by Hun Sen's co-prime minister and son of Sihanouk, Norodom Ranariddh. He bought up the Khmer Rouge mainstream. As the hardline imploded with murderous vengeance. Here's the inrtrepid Nate Thayer on that tragi-comic end. So the billionaire communists won over the socialist leaning royalists. And Sihanouk retired to play a PR monarch role as father of the nation. The country was finally at peace and had the stability of the tyrant. There was no real room left for Sihanouk to move - and he was getting old. So he bailed - leaving progress to 'tooled up' neo-liberalism. And he went back to making movies. But still, he made movies. And wrote endless letters to journalists who had aroused his ire or interest. Who was sometimes a buffoon. Who lived a life packed full of more drama and intrigue than any script would deem credible. Who was a feudal lord - a divine King - in a country where AKs and bicycles were still 40 years after his coronation the only sign of the modern world. Out in these centuries old villages WW111 was fought by puny proxy. One thing that came from the sky that didn't bring death. Helicopter largesse in a water-buffalo world.